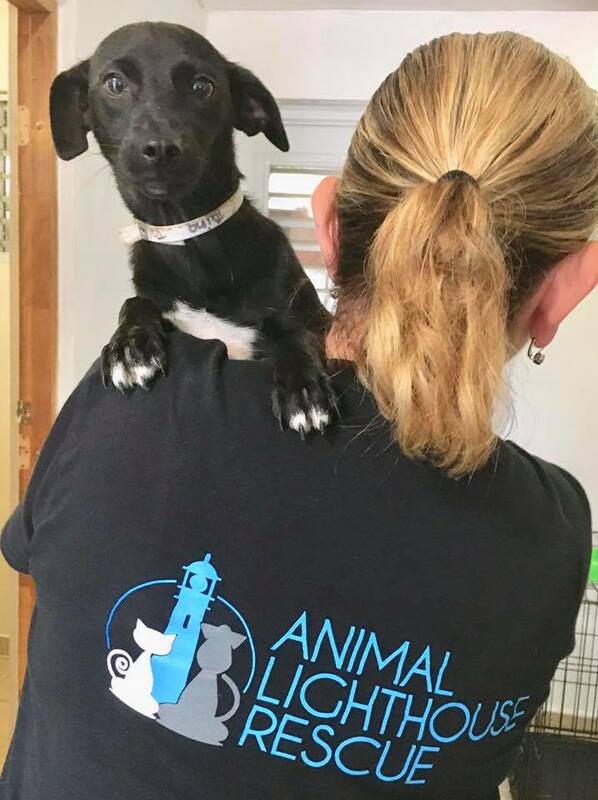 Last month, Top Dog Tania, owner of Camp Canine and Chairman of the Board at Animal Lighthouse Rescue, traveled to Puerto Rico to visit El Faro de los Animales. El Faro is the sister-sanctuary of Animal Lighthouse Rescue located on the eastern coast of Puerto Rico. They are the ‘on the ground’ rescue and rehabilitation team that works to save stray dogs (“satos”) from the streets of Puerto. Once a dog is deemed healthy and socialized, Animal Lighthouse steps in. 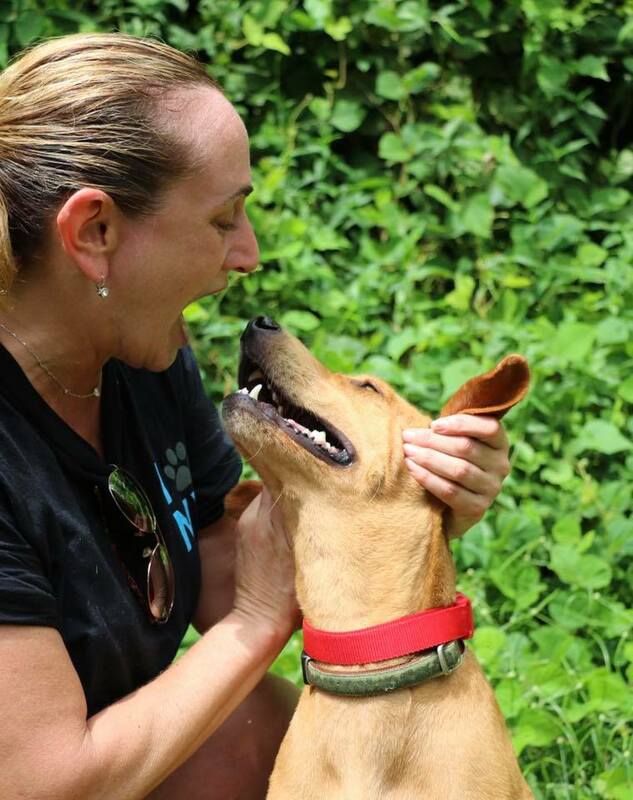 The ALR team in NYC plans and funds the dogs’ transportation from Puerto Rico to NYC, and then places them in foster homes while searching for their ‘furever’ family. On Thursday October 4th, Tania (accompanied by Lori Squire and Karie Jabe, two other members of the ALR team) boarded a flight bound for San Juan. As part of their luggage, they had brought with them empty dog carriers – carriers that would soon be filled. When they arrived at El Faro that afternoon, they toured the facility and met the doggies. There are about fifty dogs in various stages of rehabilitation and health at the facility. One of those dogs had just been rescued that morning while Tania, Lori and Karie were on their flight. While running errands that morning, Liza Arias, the Director of the sanctuary noticed a small, squatty chocolate lab-mix living in the Walmart parking lot. 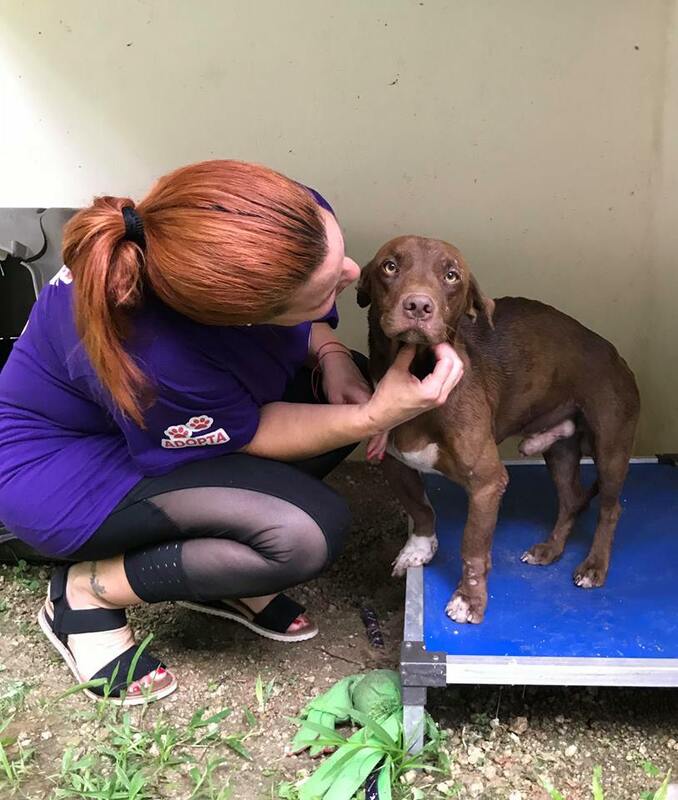 (Tania named him Wally, in honor of his former ‘home.’) At the time of this writing, Wally is at our partner vet in Puerto Rico, Hospital Para Mascotas, getting neueterd and healthy for his upcoming travel. As Liza was coaxing Wally into her car, the security guard at Walmart told her that there are usually two other dogs that call the parking lot their home as well. So, of course, the ALR team agreed that they should return that weekend. As the group toured the sanctuary on their arrival, they were able to observe the lasting devastation from Hurricane Maria. Last year, Maria literally took the roof off of the main building that housed the dogs at El Faro and destroyed most of the outdoor runs as well. Their sanctuary used to have a capacity of 110 dogs, but now they can only house a maximum of fifty. The majority of those dogs are housed outside, as the main building is no longer safe (and has no roof!). When there is a storm coming, the volunteers of El Faro collect the dogs and keep them in their own offices and homes until the storm passes. The main building of the facility post-Hurricane Maria – now without a roof! That first night, Liza hosted the ALR team at her own home. In her home, she fosters numerous dogs who are not yet socialized or healthy, including Ari, a feral momma of pups that ALR has already rehomed (Bethany and Jojo are Camp Canine regulars!). Ari has come a long way, though: she was able to take a treat from Tania’s hand. But she is still not quite ready for New York. Liza and the good folks in Puerto Rico will continue to work with her to try to get her ready. Friday was photoshoot day! In order to find the pups homes, ALR needs to have great photos that show off not only their good looks, but their personalities as well. Karie, Lori and Tania joined El Faro’s team and spent hours taking pictures of all the dogs who are healthy and socialized enough to come to NYC in the foreseeable future. It was not all the glitz and glamour that you might image when you think of a modeling photoshoot – it was 100 degrees that day; everyone was hot and sweaty, including the dogs. There were numerous uncooperative (and sometimes poopy) models. But they finished with hundreds of adorable photos, and some of the dogs they photographed have already found homes! On Saturday, Lori flew back to NYC, accompanied by a furry friend in her formerly empty carrier. Tiny, now named Zoe, already has a home with a loving momma in the UWS and is a Camp Canine regular, and Daisy was also adopted by a family on the UWS! Tania and Karie stayed in Puerto Rico for one more day. They used this day to return to the Walmart parking lot and, sure enough, they spotted the two dogs that the security guard had told Liza about. These big, beautiful Lab mixes were eager to follow the team (and their treats) into the car. 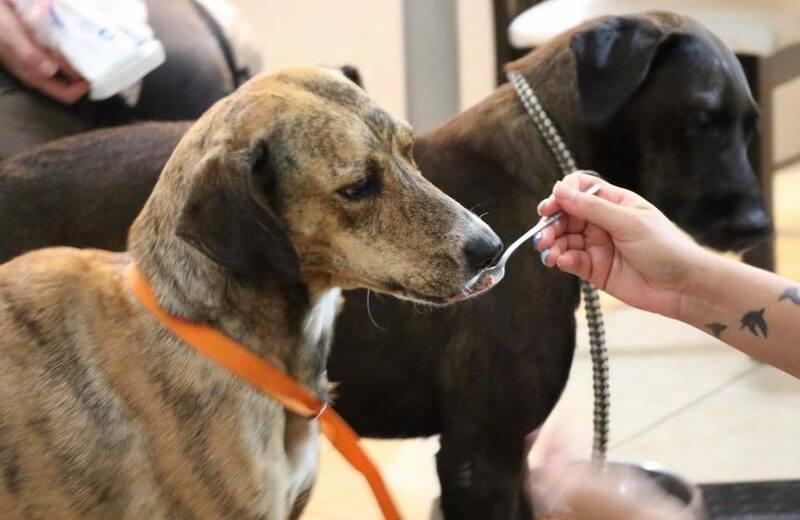 At El Faro they received check-ups, vaccinations, lots of yummy food and love. They were named Laura and Ashley in honor of a mutual friend of Tania and Karie’s. The following day, Tania and Karie filled their three empty carriers with Daisy, Arthur and Mario and made their way home to NYC. Mario was a last minute addition – Tania fell in love with him, so she got him a seat on the plane (as the airline would only allow one dog per purchased seat.) She’s fostered him at her home until he finds his furever home last week. (L to R) Arthur, Mario and Daisy. Mario and Daisy have since been adopted! Of the 50 dogs currently at El Faro, around 15 of them are ready to come to NYC. It is a challenge getting them here – the small dogs can be counted as a ‘carry ons,’ but the big dogs need to travel in cargo. ALR is comfortable working only with certain airlines in this capacity. In addition, if it’s too hot in Puerto Rico then they have to cancel the flight for the dogs for safety reasons. Nevertheless, the team persists – there are plans for many of the dogs to make their way to NYC in the coming months. Keep an eye on social media to learn more! Although both El Faro and ALR continue their rescue efforts, it is a challenge given the current condition of El Faro and the availability of flights. 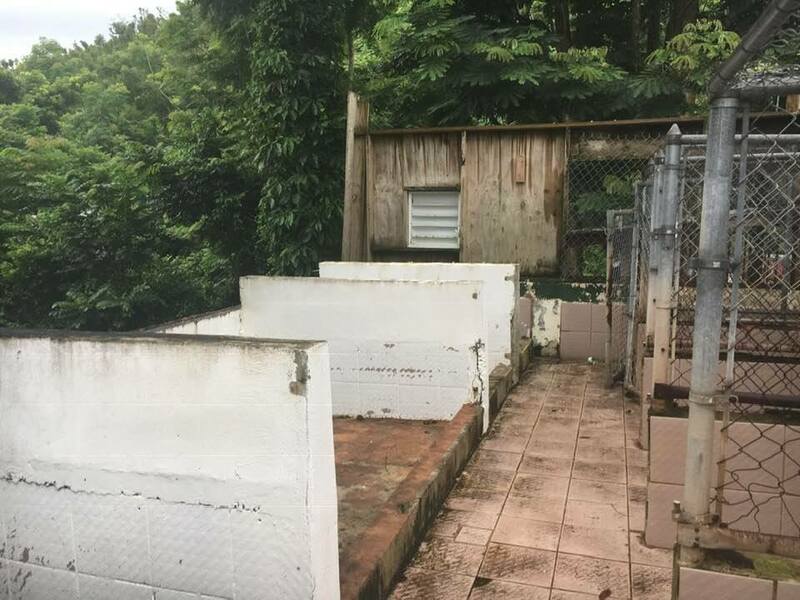 Your financial donation can go a long way in saving the lives of hundreds of dogs; from reparing the facility so that the dogs can sleep indoors, to providing transportation from Puerto Rico from NYC. If you’re interested in donating to ALR, do so here. We’re thankful for and proud of the selfless people who make up the ALR and El Faro teams; and we know that each dog they’ve saved is thankful for them as well.